I haven't been this excited about an ingredient for some time. Short ribs are my new best friend. I'd marry them if it wasn't weird. If you haven't cooked short ribs, if you haven't even heard of them, then read up. They are inexpensive with a rich taste and texture, easy cooking and a joy to plate. It was laughable really. I only cooked short ribs this Friday because I'd bought one-sixteenth of an English Longhorn steer but the ribs I cooked weren't off that animal. Host Mike - brother of Danny, one of our frequent flyers - wanted slow cooked beef for his birthday, a lively party of ten. Flashback to: a few weeks ago and me agreeing to enter a syndicate and buy a whole animal with Peter, a Cambridgeshire farmer and Facebook friend. I told Mike I'd probably serve up some of our much admired beef shin but I couldn't be sure until my bovine fraction arrived. Sadly a conflation of Cambridgeshire contingencies meant the meat arrived late on Friday morning. And I had a problem, not with the quality but with the cuts. Bags of brilliant fillet, rump, feather, silverside, brisket, shin, mince... but no single joint large enough for ten. Bugger! Despite having a serious amount of cow, I needed more. Fast. I rang up my butcher in Oakwood. "Jim, can you deliver me some shin? I need about three kilos." But Jim had no shin. He'd backed off the stewing steak. "It's the fine weather." He explained. "No one's braising beef." Damn the fickle English climate. Alternatives? "Brisket?" Nah. I don't trust it. In my experience, brisket is unpredictable. The exact same cooking can result in succulent, slippery chunks... or beige carpet... from a hallway... of a rented flat. "How about some short rib? You know, Jacob's Ladder?" I said I'd call him back. I knew Anthony Demetre respects the short rib so I checked his recipe. It felt familiar. Slow cooking in a delicious braising liquor. A quick internet trawl through the chefs I trust: Jamie, Hugh, Phil Howard encouraged me. Short ribs were much like shin but they held a huge attraction for the home cook in that they are pre-portioned. You buy one per guest, you cook one per guest and you serve one per guest. Big, lubricious joints like shin, chuck or blade can be a pain to portion up but if you pre-portion them you risk over cooking and break-up. So what is a short rib? You're probably familiar with the fore rib and the rib roast; they're one of the best and most expensive oven joints of beef you can buy. They come from the top of the animal - the big muscle near the backbone. 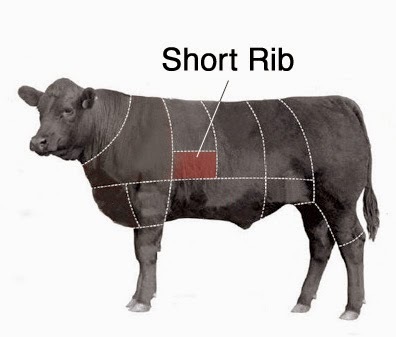 Short ribs are lower down, in location and price; closer to the belly and between ribs 5 and 8. This is an excellent butchery video that explains it all. There are several cuts of short rib but the most common in this country is called, unsurprisingly, English cut, or surprisingly 'Jacob's Ladder'. I can't find the reason for the biblical allusion. Probably just the appearance of the whole joint when held longways. I was surprised when they arrived, at the size mainly. Short ribs are thick bricks of meat, nicely marbled with fat and with a broad, thin blade of bone running their length. First thing to do is sear them for flavour and colour. Same thing really. I have a magnificent heavy Lodge cast iron pan now that holds heat well. It's hard to get a really hot pan with a domestic hob. Ideally you want a very brief contact with the cooking surface that's hotter than the sun. The object here is to caramelise only the outside while leaving the insides cool and pink. When the recipe tells you to use a smoking hot pan, that's what they mean. Many of the recipes I found were variations on barbecue beef but as this was my first time I stuck with my shin recipe. I'd sautéed off a dice of three carrots, two onions, a large leek and three sticks of celery. To that was added a handful of thyme, a few inches of rosemary and three tomatoes. After that I added a bottle of red wine, half of port and reduced the whole by half again. The meat was placed in this and the whole pot was brimmed up with stock. This is the largest braising pot I have and ten short ribs only just fit. This is one of the reasons I can't cook for more guests. I've been asked so many times to squeeze in a dozen. Sorry. Can't be done. Bring this back to the boil, lid on and place in a 150°C oven for about three hours. I doubt an extra 30 mins would do any harm. The beef contracts back along the bone, leaving it poking out: a handy serving handle. It's almost the comedy joint: a caveman cutlet. I took the beef out a good hour before I would serve it. This allowed me to take a small pot of the cooking liquor and reduce to a sticky gravy which only needed a little seasoning and a fruity dab of redcurrant jelly to finish. The ribs were served with panfried whole leaves of black cabbage (blanch, refresh and store in ice water, then fry in seasoned butter just before serving), beetroot purée and roast red onion. After some suggestion of a low carb meal, Mike caved spectacularly (and correctly) and requested roast potatoes too. 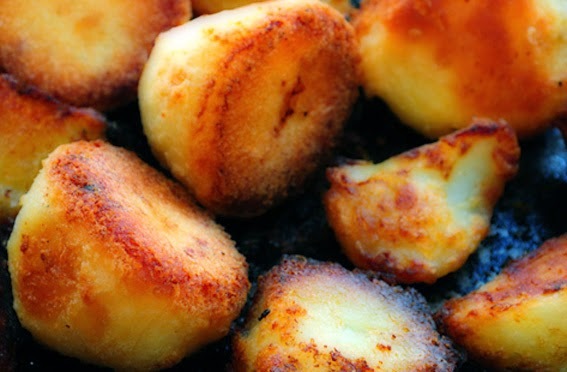 I think my roasties are among the world's finest; not a claim I'll make easily. I want crunchy exteriors, deep golden, friable edges and fluffy insides. Those meekly tanned, leathery efforts are an insult to their cooks. If I wanted jackets I'd have left the skins on. I have a few rules, most of which you'll probably be familiar with. We are a post-Delia nation after all. Use Maris Pipers. These are the least wet spuds available. It's all about the starch. Lots of dry matter gives you a fluffy finish, little dry matter and you have a soapy texture. Parboil the potatoes. Heston does it almost to destruction but that's a world of pain. I usually stick around 12 minutes. Dry the potatoes after boiling. Space them out on a clean tea towel and allow them to steam themselves dry. You can rough up the surface by gently shuffling them about too. Heat the roast pan on the hob and make sure your oil is very hot. Roll the pots in the oil, covering all sides. Use goose fat. I'm not as fascist about this I once was. I've used sunflower oil with decent results. Personally I think olive oil imparts the wrong flavour. Flavour the oil. Fry up some onion or shallots first and then some thyme. leave the aromatics in. the onion can also be served up. On this occasion I had some chunks of bone marrow so I roasted that too. Turn the potatoes half way through the cooking. Cook for at least an hour. Ignore recipes that pretend you can do it in less. I don't think the temperature matters as much as the time. I tend to go for 90 minutes at 180°C. Much above 200°C and things can char to bitterness. You can always take them out early. Roast pots will reheat without worry. That length of time means the onions will be almost black and your pots will have a savoury bake to them; a scarf of invisible umami (sorry). I'm going to be cooking short ribs a lot. I want to do a real 'lo and slo' Texan style dish. Sadly, I don't have access to a cold smoker (I mean the kit, not some bloke standing outside Wetherspoons in January, nib end in crooked fingers). A 24 hour marinade of balsamic vinegar and sweet onion purée followed by an overnight cook; a long kip in a warm duvet. Serve it on a bed of zingy salad and something soft like carrot purée or celeriac. When Mike arrived with his partner Warren, I was discomfited to hear them discussing their lunch at The Ledbury. There are only nineteen Michelin two star restaurants in the UK and Brett Graham's Kensington establishment is one of them. I've been. It was excellent. That's not intimidating is it? Now I never pretend that I am 'fine dining' but still... I didn't want them wistful at the memory when faced with my domestic output. They seemed to enjoy it. In fact. both were very generous in their compliments. Not that I trust compliments. You know what the English are like. Mind, Warren is from South Africa. And the plates did come back clean. That's the only praise I believe. Warren on the left, Danny on the right. Warren's probably thinking: it's not as good as The Ledbury.